To do: Write my celery! What I did: Today’s morning lecture was about Linked List. My background in C++(very limited, but totally there!) helped me understand the concept because of memory space. The idea of “linking” the nodes together but deliberately telling it what the node’s “next” is, made sense. 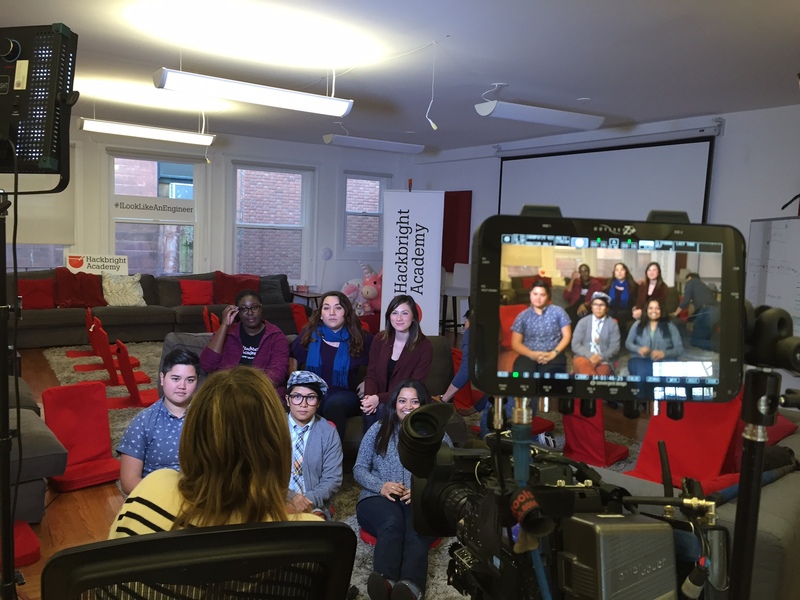 The Today show came and filmed us – they are doing a segment about women in technology. They asked six of us to be part of a group interview about our our background, why we chose technology, how we feel about what we are doing, why its important to #changetheratio. It was a great opportunity to be able to hear amazing stories from my fellow Hackbrighters and to share my own. It is an honor to part of a group of strong, hardworking women with such diverse backgrounds. I was told that it should air sometime the first two weeks in December. I started working on my celery, which meant I had to set up RabbitMC server and doing the research on how that works and its own set up. Then I made my celery instance and ran my flask app through it and moved over my processing_queue function and renamed it process_transit_request. Twilio is sending my user a text message using their phone number! 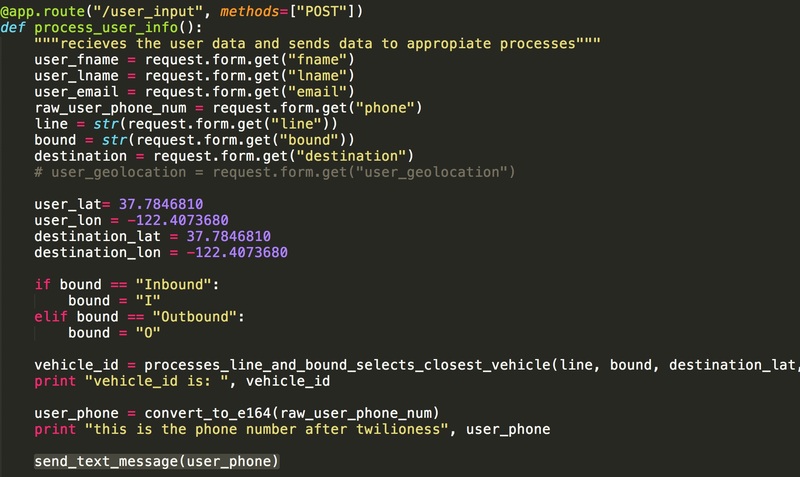 I did get a saturated by Celery and Rabbit so I moved on to my Twilio and I was able to send a text message via my webform after I find their vehicle’s id and process their phone number (to be in the format that Twilio needs). It was super cool because this was a great way to let me know when my flask route was complete.If you want to support me, send me your phone number and I’ll text you too! Twilio is super easy to use and last week we went on a tour of their office. They office culture is something that I am defiantly something I am interested in – positive, growth, development, mentoring and great on-boarding – plus the tech is super cool! I met with my mentor Andrew in the evening and we went over the high level concepts and processes of threads and asynchronous processes that use the same data. He explained the idea if one process is writing to a variable that another process needs it’ll cause an issue, how to keep that from happening, one can implement locks, but that can still cause issues with deadlocks (one thread need someone of the other thread, but neither gives it up b/c it needs to process) and a whole mess of situations. Which was really cool. I told him about what I’ve been learning in lectures and we talked about the linked list loop and it was fascinating – he didn’t tell me how to find the actual loop, but rather how I can determine if there is a loop, which was cool (which again, it came back to C++!) I love it! My Thoughts/Process: I didn’t get at much done as I wish, but I’ve noticed that that has been a trend. Its been challenging to sit in the discomfortable of not knowing how to implement a new technology and literally not writing as much code. I am happy that I am not writing code since I don’t have a solid understanding of what I am doing, but it is uncomfortable to not know regardless. It was fun to be interviewed for the Today Show. This was totally out of no where, and I’m honored to have been one of the fellows that were chosen. Its been a long day and I am ready to get some sleep.